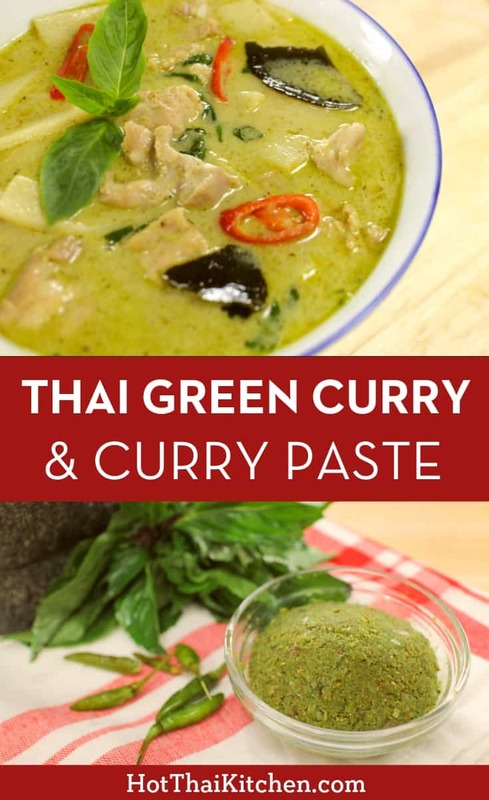 Thai green curry is one of the best known dishes of Thai cuisine. Despite its complex flavours, it is actually quite easy to make at home! Reduce ¾ cup coconut milk until thick and coconut oil starts to separate from the coconut milk (if the oil doesn’t separate after it has reduced until very thick, it’s okay, just proceed with the recipe). Add curry paste and sauté, stirring constantly over medium heat for about 2 minutes until aromatic. If paste sticks to the bottom of the pan, you can deglaze with a little bit of the remaining coconut milk. Add chicken thigh and stir to mix with the paste. (See below if using chicken breast). Add kaffir lime leaves, chicken stock, remaining 1 cup of coconut milk, palm sugar and 1 Tbsp fish sauce. Bring to a simmer and let simmer gently for 10-15 minutes or until the chicken is fork tender. Once the curry is done simmering, add bamboo shoots and bring to a boil. If you prefer your peppers to be more cooked, add them at this stage. Once boiling, remove from heat. Taste and add more fish sauce and/or sugar as needed. Stir in Thai basil and spur chilies or bell peppers. After sautéing the curry paste, add kaffir lime leaves, coconut milk, chicken stock, palm sugar and 1 Tbsp fish sauce; bring to a boil over high heat. Add chicken breast and cook until chicken is about 70% done, about a minute. Add bamboo shoots and bring to a boil. If you prefer your peppers to be more cooked, add them at this stage. Once boiling, remove from heat. Toast coriander seeds by adding them to a dry sauté pan and stir constantly over medium-high heat until the seeds are aromatic and slightly darkened, about 4 minutes. Cool on a plate. Repeat with the cumin seeds. Using a mortar and pestle, grind toasted coriander seeds, toasted cumin seeds, and white peppercorns into a fine powder. Remove from mortar and set aside. Add chopped chilies and salt to a heavy-duty mortar and pestle; pound into a fine paste. If the mixture feels too wet at any point, add some of the ground spices to absorb the liquid. Add basil leaves; pound into a fine paste. Add lemongrass, galangal, kaffir lime zest, and cilantro roots; pound into a fine paste. Add shallots, garlic, and any remaining ground spices; pound into a fine paste. Add shrimp paste and pound to mix. When using store bought curry paste, the saltiness and spiciness can vary greatly between brands. I would suggest starting out with about 50g (~3 Tbsp) of paste, and you can always add more after. If subbing granulated or brown sugar, start with just 2 tsp and taste and adjust from there.